SDG-implementation at national level: What's the point of national reports? The national voluntary reporting to the High Level Political Forum of ECOSOC is a practice that has gained traction, as dozens of governments are volunteering each year to participate and contribute their VNRs. 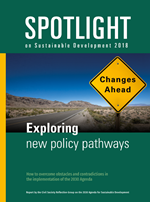 A number of CSOs have prepared their own shadow or spotlight reports to follow-up on their governments efforts to implement the 2030-Agenda. Rising inequalities and the need to substantially change policies to achieve the SDGs is a common theme in many of them. Is there a meaningful dialogue between the official and the alternative reports? What is the value of the whole exercise. The High-level Political Forum, United Nations central platform for follow-up and review of the 2030 Agenda for Sustainable Development and the Sustainable Development Goals. You will find here the information of Social Watch participation in the framework of the HLPF 2018. Jointly organized by Arab NGO Network for Development, Center for Economic and Social Rights, Development Alternatives with Women for a New Era, Public Services International, Global Policy Forum, Society for International Development, Social Watch, Third World Network with support from Friedrich-Ebert-Stiftung. The world is off-track in terms of achieving sustainable development. Fundamental policy changes are necessary to unleash the transformative potential of the SDGs. In particular, there is a need for more coherent fiscal and regulatory policies and a whole-of-government approach towards sustainability. The combine MoI and FfD agendas should tackle the removal of many of the structural barriers to the socio-economic transformation and advance systemic reforms of global economic frameworks to realign them with the imperatives of human rights, gender justice, people-centeredness and sustainable development. Despite the high-level political promises of the 2030 Agenda, the world is off track to reach the SDGs, the cost being paid by all those people and communities that continue to be marginalized in the face of a world economy that is increasingly focused of its new frontiers of digitalization and dematerialization. The latest economic cyclical upturn, not generalized and mostly centred within the Global North, has been accompanied by an increase in hunger and the worsening in the profile of vulnerabilities, heightened carbon emissions, and the persistence of structural levels of inequalities between and within countries. Our economy fails when it downturns and fails us again when it moves forward.